A tribal tattooed GBA SP will be available in Europe from June 18th for around 129 - 139 Euros. They’ve been around since 2000 B.C, over 10 million Americans have one and celebrities such as Eminem, Robbie Williams and Angelina Jolie can’t get enough of them. What are they? That’s right, tattoos – coming to a Game Boy Advance SP near you soon! Confused? Well, Nintendo today announces the latest variation of the successful Game Boy Advance SP range, the limited edition Game Boy Advance SP Tribal Edition. Guaranteed to meet the needs of the coolest gamers this summer, the hip new console customised with a tribal tattoo pattern will launch across Europe on June 18th 2004. 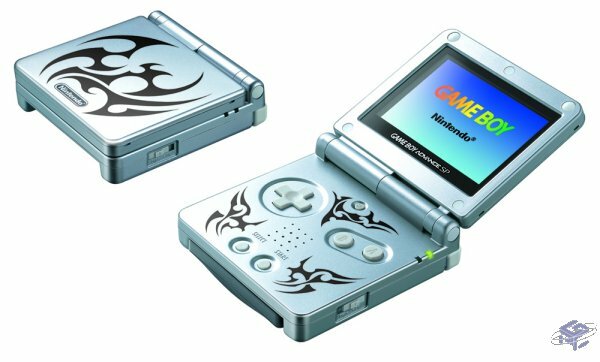 For gaming on the go this summer, the Game Boy Advance SP Tribal Edition is all the rage. The tribal tattoo, based on ancient designs originating from Polynesian and Indian culture, makes this console both unique and original. The Game Boy Advance SP Tribal Edition is guaranteed to appeal to the more style conscious gamer, while it still boasts the ultimate gaming experience that Nintendo is famous for. Whether you are at a skate park with your mates, hanging out at music festivals or just chilling in the park, make sure you take the ultimate style gadget, the Game Boy Advance SP Tribal Edition with you. Over 400 games will be available for the new urban console by the end of 2004. Fantastic games to look out for include Spider-Man 2 The Movie Game (Activision), Sonic Advance 3 (SEGA/THQ), F-Zero: GP Legend (Nintendo), Donkey Kong Country 2 (Nintendo) and Harry Potter and the Prisoner of Azkaban (Electronic Arts). The Game Boy Advance SP Tribal Edition goes on sale across Europe for a limited period only on June 18th 2004 at the estimated retail price of around 129 - 139 Euros. I think he means it will discourage parents from buying it for their kids. I think the design is kickass. Too bad I live in th US and already have one. this style is geared towards the "mature" market, i.e. those who buy things for themselves. parents can continue to buy the regular gba-sp for thier children. TVman like but think they make too many type of GBASP. I don't like Nintendo encouraging Tattoo's. Plus it's kinda pretty very ugly. I saw that picture and thought, "Game Boy Advance, now with more Zell." (Think FF8.) As for the design, I don't not like it, but it's not enough to make me want one to replace my current one. I really don't much like the design myself either. If they had the pattern go better with the design instead of using what seems like random lines maybe it'd look better.